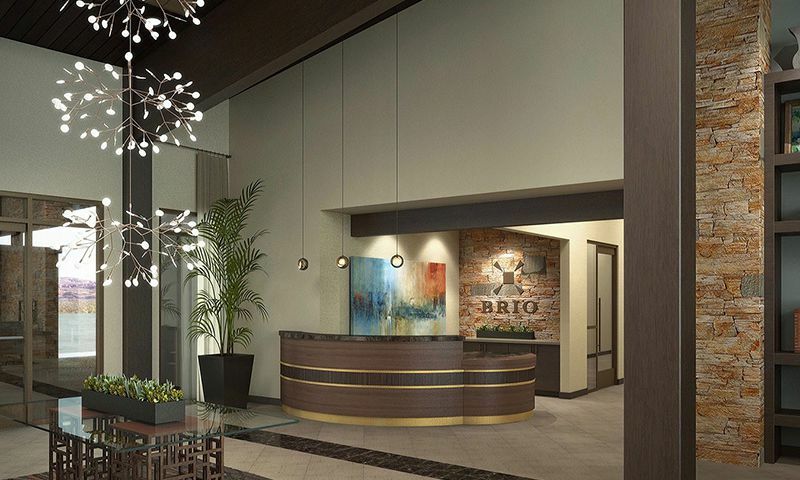 Brio is a beautiful new community in St. George, Utah. This neighborhood will contain 610 single-family homes upon completion and boasts highly desirable amenities sure to please any resident, including a spacious clubhouse and several sports courts. Developed by reputable builder Jack Fisher Homes, Brio is sure to provide classic amenities with modern homes in the beautiful Southern Utah area. At the center of this community is the clubhouse. With 14,500 square feet of indoor space, the clubhouse is sure to provide plentiful areas for residents to get into shape and explore their interests. A state-of-the-art fitness center, with over 1,500 square feet of space, has cardiovascular and weight-training equipment allowing for a diverse fitness routine. Making new friends is easy because Brio's clubhouse has social rooms, a lounge, as well as a card room. For getting in a few laps, Brio also offers an indoor pool and spa for relaxing your muscles after a workout. The terrific amenities continue outdoors with a pool, spa, and patio for enjoying the warmer months. Brio also has two tennis courts and eight pickleball courts for some friendly competitions. Your four-legged friend will also love meeting their neighbors at the pet park. Walking and biking trails weave throughout the community's parks and natural space, while a playground is also available for when the grandkids come to visit. Jack Fisher Homes began development of Brio in 2014 and this community will have 610 single-family homes upon completion. Ranging in size from 1,595 to 2,773 square feet, these homes offer three or four bedrooms, two to three bathrooms, and an attached two to three-car garage. Some homes are developed with extra spaces for a den or office, dual master bedrooms, large courtyards, tray ceilings, and gas fireplaces. Living within Brio means enjoying a low-maintenance lifestyle with like-minded neighbors. Spend your days challenging friends on the tennis or pickleball courts or go for a swim in the indoor or outdoor pools. Gather with neighbors in the social rooms or lounge. No matter how you enjoy spending your day, Brio will have something for you. Brio is located in St. George, Utah. The community is located just down the street from several stores for everyday needs including a Walmart Supercenter, Target, Best Buy, fast food restaurants, Costco, Home Depot, and even a movie theater for catching a matinee. For regional travel, the St. George Municipal Airport is just 15 miles away along Interstate 15, which is a couple minutes away. Dixie Regional Medical Center is also conveniently down the street. St. George, Utah is a perfect place for the outdoor enthusiast who wants to be near big-city attractions. Hike through red rocks in Pioneer Park or visit the Red Cliffs National Conservation Area. The natural history fan will love taking the grandkids to the St. George Dinosaur Discovery Site or visit the Rodenbruch Wildlife Museum. Las Vegas, with its world-renowned attractions, is approximately 90 minutes away. Brio has the location, beautiful homes, and sterling amenities to make it a desirable community in Southern Utah. Clubhouse - 14,500 Sq. Ft. Check back soon for more information on the lifestyle in Brio. Jack Fisher Homes began development of Brio in 2015 and this 55+ community will have 610 single-family homes upon completion. Ranging in size from 1,595 to 2,773 square feet, these homes offer three or four bedrooms, two to three bathrooms, and an attached two to three-car garage. Some homes are developed with extra spaces for a den or office, dual master bedrooms, large courtyards, tray ceilings, and gas fireplaces. My wife and I have lived at Brio for about six months and are loving every minute of it. The clubhouse is modern and beautiful. There are both indoor and outdoor pools and whirlpools as well as a nice gym. All have a beautiful view of Pine Valley mountain. Homes are well built. We do not yet have a great number of residents, but houses are going up fast so that situation should change soon. We can't wait! 55places.com is not affiliated with the developer(s) or homeowners association of Brio. The information you submit is distributed to a 55places.com Partner Agent, who is a licensed real estate agent. The information regarding Brio has not been verified or approved by the developer or homeowners association. Please verify all information prior to purchasing. 55places.com is not responsible for any errors regarding the information displayed on this website.